Francis Walker, MD, conducts research in movement disorders and has pioneered the development of neuromuscular ultrasound as a sophisticated, low-cost diagnostic tool. He believes there is tremendous opportunity for partnerships to expand the use of the powerful imaging technology. Walker received his medical degree from the Indiana University School of Medicine in 1978, followed by an internship in internal medicine and then residency in neurology at the University of Iowa University Hospital and Clinics through 1981. He served a fellowship in movement disorders and as an instructor in the department of neurology at the University of Michigan School of Medicine from 1982 to 1983. In 1983, he returned to the University of Iowa University Hospital and Clinics as an associate in the department of neurology. In 1984, he joined Wake Forest University School of Medicine as an assistant professor of neurology. He was named full professor in 1997. 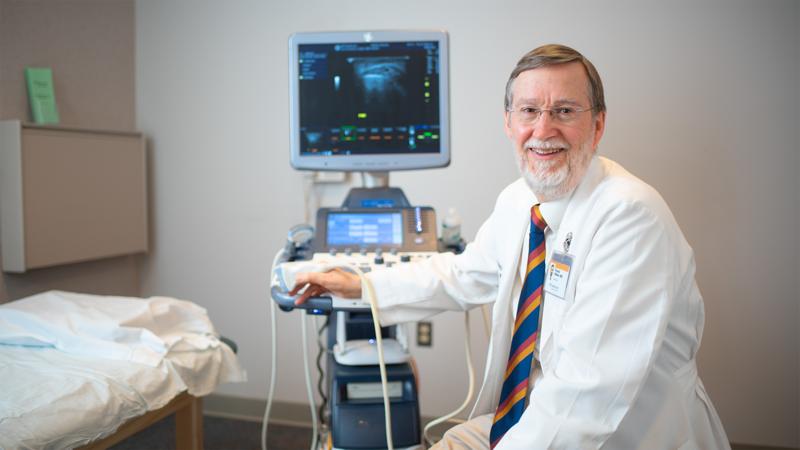 Throughout his career, Walker has followed two distinct tracks in his research: movement disorders such as Huntington’s disease and Parkinson’s disease, and nerve and muscle imaging through electromyography and neuromuscular ultrasound. He has long been involved with clinical trials of movement disorder treatments and is currently focused on developing injection of gene therapy vectors directly into the spinal column. Because rapid advances in ultrasound imaging have allowed access to very powerful diagnostic information, Walker is interested in proliferating the use of the technology in medical practice. He hopes to use it to screen populations who may be vulnerable to common neuromuscular disorders such as carpal tunnel syndrome. Walker believes that exciting recent research developments will soon lead to effective new treatments for the most common neurodegenerative genetic disorders, particularly in Huntington’s disease. He participates in that type of research as part of a massive, “big team” scientific effort conducting large-scale clinical trials. On a more individualized, hands-on level of research, he works directly with patients to help advance the field of electromyography, using neuromuscular ultrasound to diagnose common nerve and muscle disorders. He believes that technology now offers the opportunity to allow cost-effective access to the diagnostics in settings outside the physician’s office, such as industrial sites, shopping malls, airports and nursing homes. Most of Walker’s experience with industry has been working with pharmaceutical companies. For example, he worked closely with Allergan to develop the botulinim toxin into what became a clinically important and commercially successful product. He believes that industry involvement is necessary to bring wonder drugs to market. Today, Walker is eager to collaborate in the development of direct-to-patient health care using neuromuscular ultrasound. He believes it offers a great opportunity to reduce health care costs, an interest of health insurance companies or large industries whose workers may be prone to carpal tunnel syndrome or other neuromuscular conditions.